Emerald Media - Five minutes with Adam Twidell. 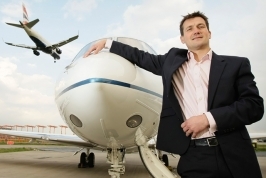 James Bourne interviews Adam Twidell CEO and co-founder of PrivateFly. JB -- What first attracted you to aviation and how did you get into it? AT -- I joined the RAF's University Air Squadron in Edinburgh and squeezed two years of free flying lessons out of the tax payer. After I graduated from University I had the flying bug and so started my flying career in the RAF. Unlike most pilots, I didn't inherit the flying bug from my family. No-one had been a pilot or in the military before me, so my parents were pretty surprised when I was so focused on flying. I lived under the approach path to Glasgow Airport during my childhood and was always fascinated by the aircraft flying overhead. JB -- In the early days, could you have imagined that PrivateFly would grow into what it has become and do you take time to appreciate it? AT -- We're still far too busy to stop and appreciate where we've got to! But I do try and focus on the successes with the team as that's so important. It really does feel just five minutes ago that Carol and I were selling the house to finance our start-up business, though it was in fact back in 2008. We have come a long way since then, but there is still so much I want to achieve with PrivateFly. JB -- In such a crowded space is it tough to differentiate? How do you get your message across? AT -- We are actually quite different from most of our competitors - private aviation still remains largely a very traditional industry, so a technology-focused model like ours, which offers price comparison alongside VIP service, was eye-catchingly disruptive when we launched. So we had an interesting story to tell, which really helped with PR. Reaching and influencing busy, discerning customers with your message is a challenge for any company. We operate a broad marketing strategy which includes digital and social media, but I never forget that old-fashioned word-of-mouth is essential too. So exceeding our customers' expectations is always the aim. JB -- I've read in previous interviews that you find your children something of a grounding influence, are there any leadership characteristics you possess that you can link back to your children? And more broadly, what characteristics do you most value in a leader? AT -- Honesty, consistency, single-mindedness. Keeping things simple and explaining yourself properly are essential for both work and family life. JB -- Is there one leader you especially admire? AT -- Lawrence of Arabia. JB -- If you had one piece of advice to a young person seeking a career in aviation what would it be? AT -- Work hard and be prepared to start at the bottom. Look for internships or volunteer if you can afford to. Experience counts for everything these days. At PrivateFly we have had some fantastic interns over the last few years. Several of them are now full-time employees and others have moved on to other great roles in aviation.